Media captionBrexit is "a very sad and tragic moment in our history"
The UK will "soon regret" leaving the EU, European Commission President Jean-Claude Juncker has said. Mr Juncker told the European Parliament that Brexit would be a "sad, tragic" moment for the EU but that the 27-member union would "move on". "Brexit is not the future of Europe. It is not the be all and end all." But, speaking in the same debate, ex-UKIP leader Nigel Farage said the EU had "learnt nothing" from Brexit and was ploughing "full steam ahead". 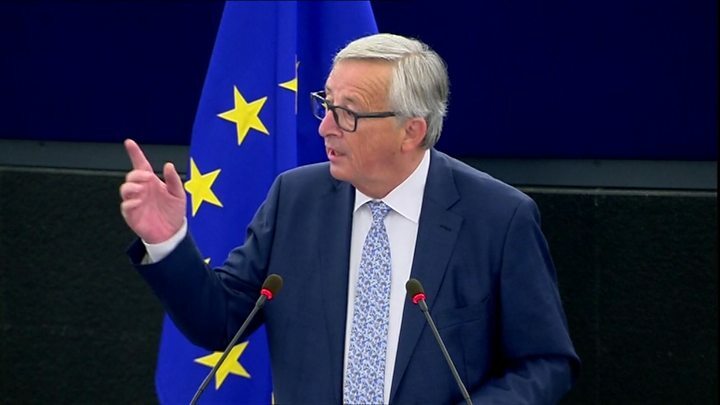 In his state of the union speech in Strasbourg, Mr Juncker proposed an EU summit on the day after Brexit, 30 March 2019, in the Romanian city of Sibiu to map out the future of the European Union. He called for closer economic and defence co-operation among member states, including more support for states outside the eurozone to prepare them to join the single currency, and reforms to the single market. Reflecting on the economic and political challenges that the continent had faced in recent years, he said the "wind is back in Europe's sails". While he respected the choice of the British people to go their own way, he said the UK's exit would prove a "very sad, tragic moment in our history" which we "will always regret". Responding to UKIP MEPs in the chamber, who had cheered the mention of the UK's exit, he added - in an off-the-cuff remark not included in advance copies of the speech - "I think you will regret it as well soon, if I might say." But he went on to stress that Brexit "was not everything" and an increasingly confident EU would continue to advance, focusing as he put it on the big strategic challenges rather than "the small things". Mr Farage, the best known campaigner in the Parliament for the UK's withdrawal from the EU, attacked what he said were "truly worrying" plans to create a single president of the EU, an EU finance minister and a "strong EU army in a militarised Europe". He said what was being proposed was "more Europe in every single direction... without the consent of the people". He also warned the idea of allowing future candidates to the European Parliament to stand on transnational tickets, rather than representing nation states, was anti-democratic and "reminiscent of regimes of old". "You have learnt nothing from Brexit. If you had offered David Cameron concessions, particularly on immigration, I would have to admit that the Brexit vote would never ever have happened," he said. Telling MEPs "thank God we are leaving", Mr Farage said the EU was "deluding itself" if it believed the "populist wave" of protests against the established European political order was over. Responding to Mr Juncker's comments, justice minister Sam Gyimah said his initial reaction was "he would say that, wouldn't he" and he had signalled a future direction for Europe that "Britain was never going to go in". Rather than "berating Britain", the Conservative MP told the BBC's Daily Politics that the EU's best interests would be served by agreeing a Brexit deal which made the whole of Europe more prosperous and secure. Negotiations between the UK and EU are continuing although the latest round of talks, due to begin on Monday, have been put back a week to allow "more time for consultation". Speaking on Tuesday, former Brexit minister Lord Bridges said the UK must be "honest" about the "complexity and scale" of leaving the EU as well as the lack of time to reach agreement with the EU. And France's economy minister has sounded a warning that it will aggressively target new business as it seeks to make Paris the pre-eminent financial centre on the continent. Changes to the country's labour laws meant France would become the "place to be" for financial services, Benjamin Griveaux told BBC Radio 4's Today, while acknowledging London would remain a major player. "We need to have a fair Brexit, but we need to move on and we need probably more clarity and less ambiguity from the British government regarding the target of Brexit," he added.